Plus… our understanding/interpretation of our epics… is not complete. And we try to make “modern versions” out of them! What is described as “vannar” in the Ramayana is interpreted as “monkey”. This is incorrect. “Van” means “forest” and “nar” refers to “human”. Therefore… “vannar” is “forest dwelling human” or “human with ape nature”. Similarly, “Jambaban/Jambuban” is depicted as a bear. This again is wrong. In ancient times… Bharatvarsha was referred to as “Jambu dweepa”… named after a type of fruit… found in abundance here. So, Jambaban was someone belonging to Jambudweepa… an ancient person perhaps. Also… Sita is thought to be the daughter of Mandodari (Raavan’s main Queen) in a story reminiscent of Karna and Kunti. They are said to have looked so alike… that even Hanuman was confused! So, we are yet to understand... the motive(s) behind Raavan's action... i.e., the kidnapping of Sita. Also... Raavan did not have 10 heads per se. He is believed to have had 10 kingdoms... each of which was represented by a different crown. Therefore, his kingdom could not have been restricted to the area covering modern-day Sri Lanka alone. Also he was a great scholar... and was well versed in all the 4 Vedas and the 6 Upanishads. Therefore, he was considered to be the equivalent of 10 scholars. Hence he was called "Dasananan"... meaning "one with 10 heads". 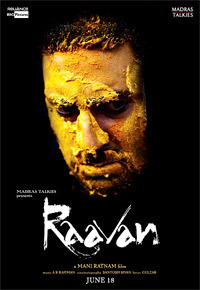 "Raavan" means "he of the terrifying roar". Raavan’s character had a lot of depth. He was not one-dimensional. He is said to have had many shades – a master of the shastras, vedas and upanishads; a devout worshipper of Lord Shiva; a great chanter of the Sama Veda; an excellent musician who could also play the 'Veena' very well; a valiant conqueror who took Lanka from (his step-brother) Kubera; a demon who brought Lord Brahma to his knees; a beast who aggressively pursued many women from Vedavathi to Rambha... many forcefully. Infact, Vedavathi is said to have been reborn as Sita... to take her revenge. While Rambha was betrothed to his step-brother Kubera's son. Yet this did not stop Raavan from taking her by force. Her pleadings that she was like a daughter to him... fell on deaf years. Raavan was cursed and could not touch Sita. He was cursed by Kubera's son... to whom Rambha was betrothed...(after Raavan ravished her). Some suggest... Mandodari protected Sita. Yet after Ram defeated and killed him... he did not show disdain or insult Raavan. He accepted him as a great King... one with several qualities. Raavan belonged to the Sun's lineage from his father's side. Even Lord Ram was a Suryavanshi Kshatriya. Sri Ram performed a penance/puja after defeating and killing Raavan. Most of us have to depend on so-called ‘scholars’, ‘translators’ and ‘experts’ to understand our epics… since we are not familiar with the sanskrit language. There lies the crux. ... Helloooooooooooo!!! Anybody there... ??!! !